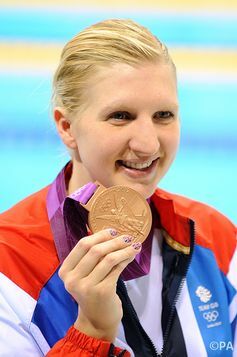 World and Olympic Champion Swimmer Rebecca Adlington (Getty). 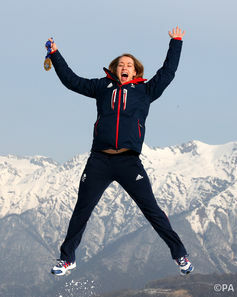 Recent Winter Olympic sporting success raises critical questions about the limits of national campaigns‘ ability to translate gold medal “inspiration” into everyday participation for women and girls in sport and physical culture. Minister for sports Helen Grant has also created controversy by suggesting women should be able to choose what sport they want to do, whether that was taking up hockey or the more feminised practice of cheerleading. The negative public reaction to this suggestion reflects the desire of many to move beyond the history of narrowly defined, feminised sport. It’s worth remembering that women were originally only able to compete in one socially approved sport during the Winter Olympics – figure skating – from 1924 to 1948. In her attempt to open up debate, Grant became caught in a complex web of ideas about gender identity, embodiment and individual choice. It does make perfect feminist sense to give women more of what they want in relation to formal and informal sport experiences. But what is at stake in these debates is the idea that this individual choice is somehow detached from the complex gendered norms that shape how women feel about their capacity, the resources available to them, and the level of inclusiveness in physical culture. There is a widening gap between what an individual woman may want to do and the market forces that regulate how sport is organised, marketed and provided with little regard for gender equity. The gender gap in sport participation between women and men has grown since 2005 despite women’s sport organisations trying to promote more diverse views of what women want in sport by delivering successful programs and contributing to parliamentary inquiries. Sport England data reveals there has been relatively little significant overall change in women’s weekly participation in sport in the past ten years. There have been some wins with more older and disabled women participating, but also losses with the participation rates of younger women falling. Clearly women need more than calls for “inspired” active choices. A key issue is how sport is though of, measured, funded, organised and promoted. Sport England includes Zumba in its classification of fitness activities and it is an example of a pursuit that has experienced rapid growth for women. Yet many pursuits that women enjoy are referred to as “non-organised”, “informal” or “unstructured”. This implies that they are not as valuable as the dominant organised sports, and are therefore less likely to receive funding. Our different research projects all point towards the problematic concept of sport itself, and the need to reimagine what it means to include more gender inclusive activities. 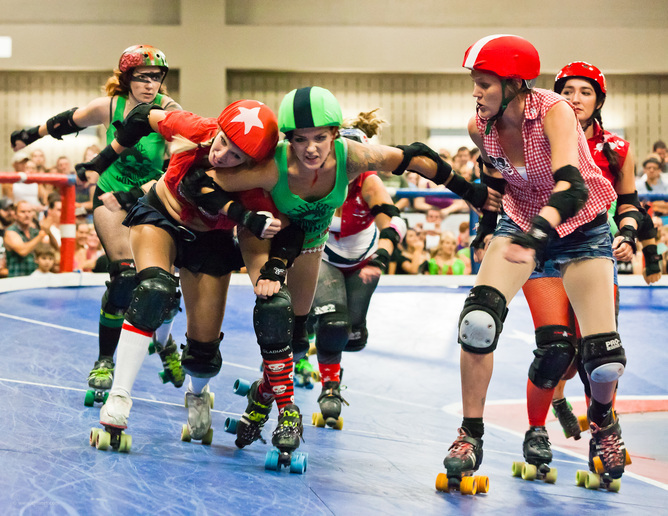 When women have created new sport cultures, such as roller derby, there remain tensions between a competitive ethos, social engagement, and sub-cultural identification. The global growth of roller derby is also an interesting example of how women’s sport culture emulates and parodies sexualised femininity by embracing rough, tough play, a performance of pain and pleasure infused with music and alternative fashion. Across many of our research projects we consistently find women describing themselves as “not sporty”: gendered expectations value women’s bodies in terms of what they look like rather than what they can do. This was starkly realised by the very public airing of Rebecca Adlington’s body insecurities. The two-time Olympic gold medal winning swimmer admitted on a reality television programme that she had been the victim of cyber-bullying over her appearance, which culminated in speculation that the Olympian may have had her nose altered. We have seen a range of parliamentary inquiries into the problem of body image and its effects on young women’s sense of agency, eating disorders and sports participation. These point toward the responsibilities of the health and fitness industry and women’s troublesome – read disordered – investment in body work as well as the wider influence of the media. Media literacy programmes have been developed in schools to counter some of the dominant images and narratives. The idea is that by creating media-literate individuals a reduction in body image dissatisfaction may follow. Serious attempts to evaluate this notion, however, are scarce. Research undertaken with 12-13 year old girls identified a gap between the critique of the media images that inform popular culture (for example the Nintendo Wii game “We Cheer” and glossy magazines) and the ways they feel about their own bodies. The girls were able to talk about the “unrealistic” body images presented in the media in computer games, size zero celebrities, and airbrushing in advertising – but they simultaneously criticised, surveyed, monitored and were fixated on the “flawed” features of their own bodies. They worked out to counter overeating and manipulated their calorie intake to reflect levels of physical exertion. Developing body confidence requires far more than teaching young women about the digital manipulation of images. There is no quick fix for how contradictory gender relationships play out through sport and everyday life. Responses need to be guided by women’s voices, and analyse how their experiences are shaped the many demands of contemporary society. In terms of sport policy, understanding how physical exertion is gendered is crucial to engaging the 12 million women who would like to do more “sport”. Jessica Francombe-Webb does not work for, consult to, own shares in or receive funding from any company or organisation that would benefit from this article, and has no relevant affiliations.